The time it takes to go through this cycle is the period of the wave. 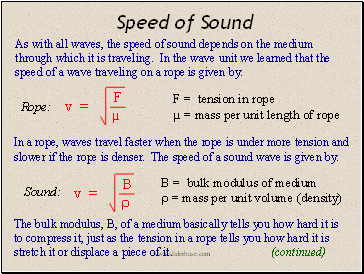 The number of times this cycle happens per second is the frequency of the wave in Hertz. 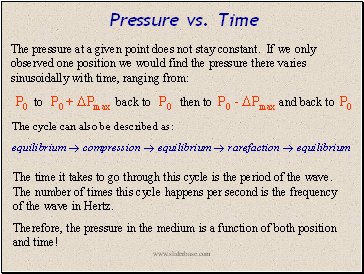 Therefore, the pressure in the medium is a function of both position and time! Rather than looking at a region of space at an instant in time, here we’re looking at just one point in space over an interval of time. At time zero, when the pressure readings began, the molecules were at their normal pressure. The pressure at this point in space fluctuates sinusoidally as the waves pass by: normal  high  normal  low  normal. The time needed for one cycle is the period. The higher the frequency, the shorter the period. The amplitude of the graph represents the maximum deviation from normal pressure (as it did on the pressure vs. position graph), and this corresponds to loudness. Pressure vs. 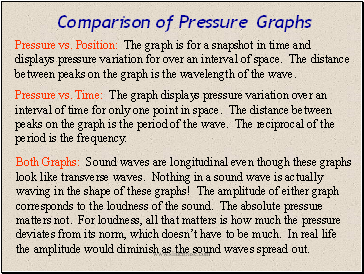 Position: The graph is for a snapshot in time and displays pressure variation for over an interval of space. The distance between peaks on the graph is the wavelength of the wave. 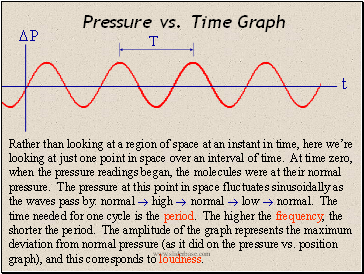 Pressure vs. Time: The graph displays pressure variation over an interval of time for only one point in space. The distance between peaks on the graph is the period of the wave. The reciprocal of the period is the frequency. Both Graphs: Sound waves are longitudinal even though these graphs look like transverse waves. Nothing in a sound wave is actually waving in the shape of these graphs! The amplitude of either graph corresponds to the loudness of the sound. The absolute pressure matters not. For loudness, all that matters is how much the pressure deviates from its norm, which doesn’t have to be much. In real life the amplitude would diminish as the sound waves spread out.